The Louvre Museum is one of the oldest and largest museums in the world, and almost certainly the most famous and situated in a grand 16th century palace in the heart of Paris. There are more than 300,000 works of art in the museum including near Eastern antiquities, Egyptian antiquities, Greek, Etruscan and Roman antiquities and continuing through to 21st century painting and sculptures. 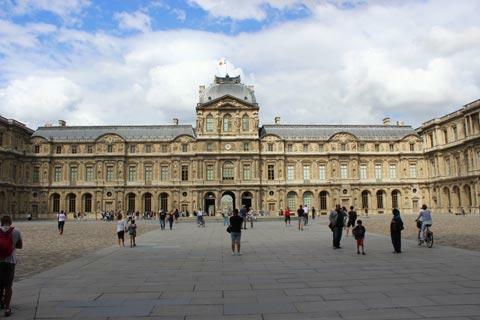 The Louvre receives more than eight million visitors a year, making it the most visited art museum in the world. 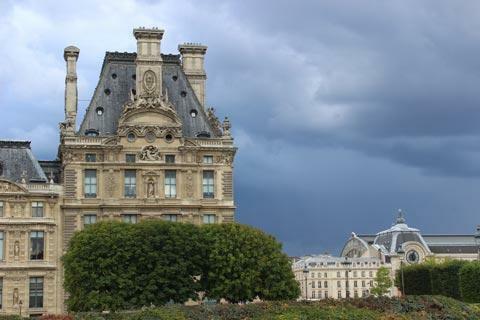 The original Castle of the Louvre was built under Philip Augustus in 1190 to defend Paris against Viking attacks. This original castle was demolished and the first building of the existing museum began in 1535. Various architects were involved in the building of the Louvre including Pierre Lescot and Ange-Jacques Gabriel. François I began an art collection with only twelve paintings, which included wonderful paintings by Raphael, Leonardo da Vinci and Titian. The collection grew and numbered over 300 pieces by the reign of Louis XIII. Catherine de Médicis enlarged the collection, and Louis XIV added over 2600 paintings and pieces of art. Originally these Louvre treasures were only displayed for the private pleasure of the kings and their court. The museum opened to the public on August 10, 1793. Napoléon Bonaparte increased the collection in a spectacular manner, bringing many works of art from the countries he conquered. Continuing its expansion under Louis XVIII, one of the most famous sculptures in the Louvre was acquired, the Venus of Milo. 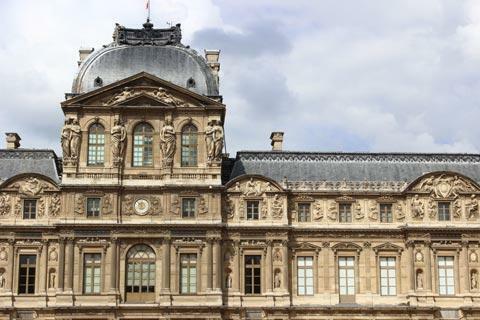 In 1848 the Louvre became the property of France. The collections continued to grow and many private donations enlarged the collection. The collections of the Louvre were still being added to by Napoléon III with the new wing representing the neo-baroque style and with many sculptures. Baron Edmond de Rothschild donated over 41,000 pieces of art in 1935. In 1947 a large part of the collection of impressionist paintings was moved to the Orangerie in the Jardin des Tuileries, now the Museum de l'Orangerie and best known for its collection of Waterlily paintings by Monet, and other paintings from 1848 onwards were moved to the Musee d'Orsay just across the river from the Louvre. 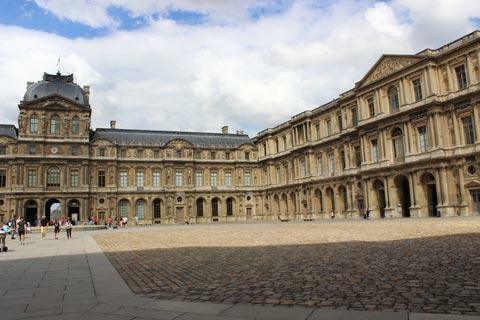 The central courtyard, on the famous axis of the Champs Elysées, is occupied by the Louvre Pyramid, built in 1989 and the main entrance to the Grand Louvre. This is a large glass pyramid, commissioned by the president François Mitterrand, that was very controversial at the time but is now largely appreciated. When you visit there are longer and shorter tours available, depending whether you want to see the most important highlights or a wider selection. Unfortunately choosing to 'see everything' is rather challenging given the size of the museum's collections so more than one visit might be necessary! Even just seeing the principal highlights you will need to allow half a day to visit the museum because of the queues and the size of the Louvre. 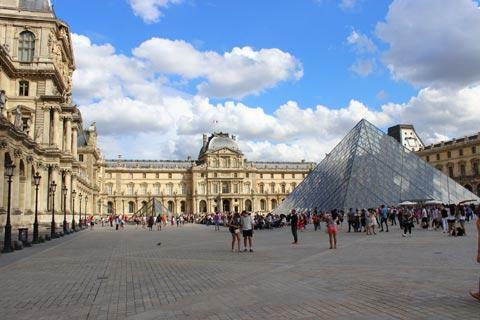 Even if you don't want to visit the Museum you will want to stroll around the Louvre buildings, to see the glass pyramid, and also to see the Cour Carrée just behind the main entrance. 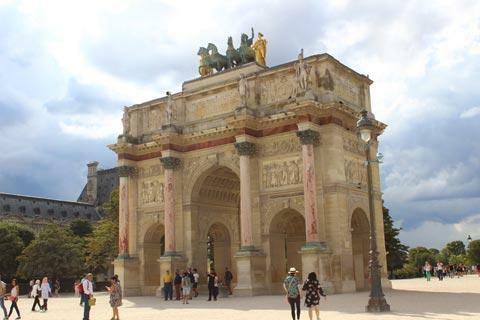 The buildings and courtyard are among the most impressive in central Paris, and also your starting point for the walk through the Jardin des Tuileries and along the Champs Elysées. At night the courtyard and pyramid take on a whole new beauty so you will need to return in the evening for a second look!